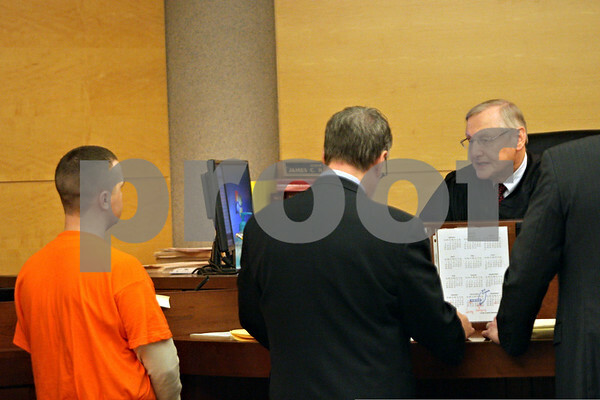 Judge James Hallock speaks to Benjamin Black (left) in a courtroom at the Kane County Courthouse in Geneva, Ill., Thursday, Oct. 17, 2013. Black is accused of having opiates in his system during a crash that killed 11-year-old Matthew Ranken of Sycamore and severely injured Teale Noble, 18, of Sycamore. Black was driving a Ford Expedition that smashed into the back of a Chevrolet Cavalier carrying the two, causing a crash that involved two other vehicles, police said. Ranken and Noble were passengers in the vehicle, which was stopped in traffic along Route 64 in Kane County.